An educational community of inquiry is a group of individuals who collaboratively engage in purposeful critical discourse and reflection to construct personal meaning and confirm mutual understanding. 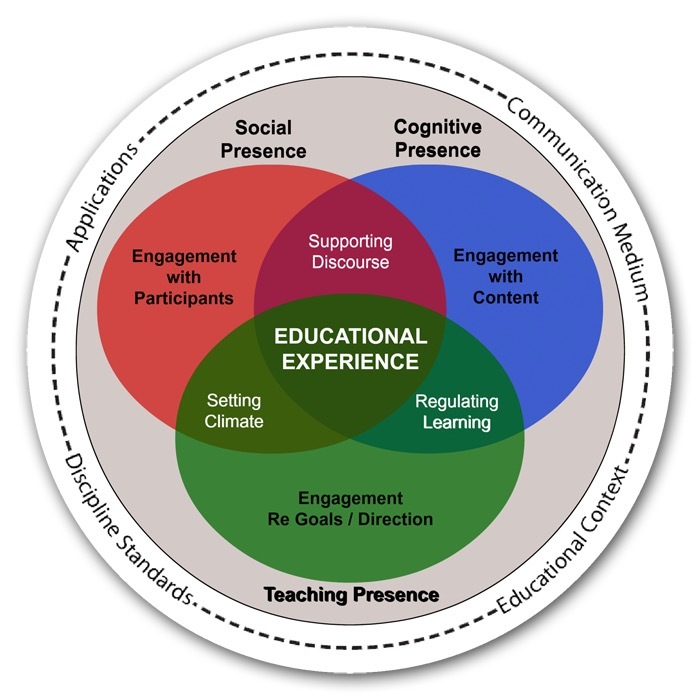 The Community of Inquiry theoretical framework represents a process of creating a deep and meaningful (collaborative-constructivist) learning experience through the development of three interdependent elements: social, cognitive and teaching presence. Outcomes of the original project were published in peer reviewed journals which, in turn, have resulted in hundreds of research studies applying and extending the original CoI theory, method, and instruments. The seminal paper "Critical Inquiry in a Text-Based Environment: Computer Conferencing in Higher Education" (Garrison, Anderson and Archer, 2000) has been cited more than 2,800 times (as reported by Google Scholar August 2015) and provided the foundation for valuable empirical research in learning theory across multiple disciplines and in varied educational settings. The Community of Inquiry questionnaire is developed and validated by a collaborative research team. The members of the team, in alphabetical order, are Ben Arbaugh, Marti Cleveland-Innes, Sebastian Diaz, D. Randy Garrison, Phil Ice, Jennifer Richardson, Peter Shea and Karen Swan. The results were presented at the Sloan-C Conference in Orlando in November 2008. A three factor solution with oblique rotation was presented. All variables loaded cleanly on the expected factor/presence. This suggests a stable instrument that could be used in a variety of studies, including large scale inter-institutional or cross-disciplinary studies. The survey in English can be downloaded here. La encuesta en español está disponible aquí. The CoI Survey is an open resource under Creative Commons license (CC-BY-SA). Permission is hereby granted, free of charge, to any person obtaining a copy of the CoI survey to use, share, copy, adapt, merge, publish or distribute the document in any medium or format for any purpose, provided that appropriate credit is given, and any modified material is distributed under the same Creative Commons license. Our sister site at Athabasca University features an extensive set of publication references, including papers, dissertations, and books about the Community of Inquiry, as well as further and more detailed information on the CoI framework, its presences, and the CoI survey. Visit the CoI Research Site. Student populations today are more diverse than ever before. Differences in ability levels, ethnicity, cultural background, and gender identity, among other factors, can provide learning environments with a rich kaleidoscope of features. With inclusive leadership and practice, student diversity can add value to the learning environment, providing opportunities for meaningful learning, personal growth, and community building. Join the Inclusive Educators' Toolbox community and contribute your own tools and ideas for inclusive education. Technology-enabled learning (TEL) has the power to transform both teaching and learning in classroom-based, online, and blended education by introducing the digital tools and resources 21st-century learners will need in order to explore, understand, and express themselves. These technologies can transform teaching by creating new, connected relationships between teachers, students, and content to improve instruction and create a more personalized form of learning. Join the TEL Resources Repository community and contribute your own resources and ideas for technology-enabled education.